"Demons from Atlantis…" Finally! A full-length trailer has arrived for a mysterious, chilly horror film titled Cold Skin, the latest creation from French filmmaker Xavier Gens (of Frontier(s) and The Divide). We posted a teaser trailer for this last summer, but haven't heard much from it ever since then, despite playing at a few film festivals. Set on a desolate island in the Antarctic Circle, the film tells of a man living there who discovers that at night the island is overrun by creatures. This trailer finally gives us a good look at them and they're quite chilling. The cast includes David Oakes, Ray Stevenson, and Aura Garrido as Aneris, who seems to be one of these creatures that one of the men falls in love with. I'm so glad they don't have to hide the blood in this trailer, makes a difference. I'm very curious about this film, something has me hooked. On the edge of the Antarctic Circle, a steamship approaches a desolate island. On board is a young man, poised to take the post of weather observer, to live in solitude at the end of the earth. But on shore he finds no trace of the man whom he has been sent to replace, just a deranged castaway who has witnessed a horror he refuses to name. For the next twelve months his entire world will consist of a deserted cabin, trees, rocks, silence and the surrounding sea. 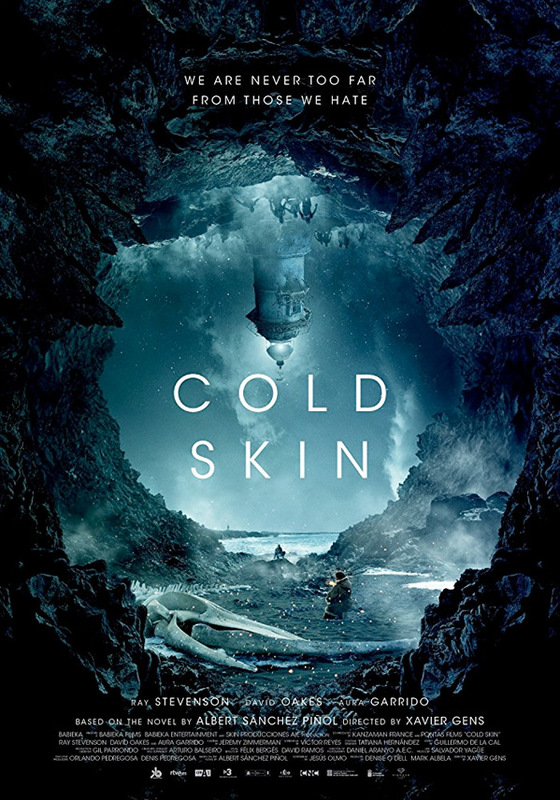 Then night begins to fall… Cold Skin is directed by prominent French horror filmmaker Xavier Gens, of the films Frontier(s), Hitman, and The Divide previously. The screenplay is written by Jesús Olmo and Eron Sheean; based on the book by Albert Sánchez Piñol. The film originally opened in Spain last fall after playing at the Sitges Film Festival. It still doesn't have any official US distributor or release date yet, which is a bit unfortunate. Stay tuned for more. Anyone else still curious?